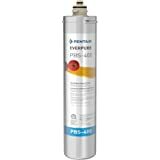 Sold by Phenom Savings and Fulfilled by Amazon. Gift-wrap available. 3.0 out of 5 starsGreat for the sole purpose of listening to music. Otherwise, look elsewhere. 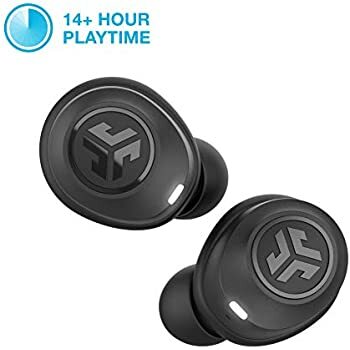 I was looking for completely wireless earbuds, given jaybirds reputation for creating earbuds that are comfortable without compromising sound quality, I decided to give these a try. Construction: the build quality is commensurate with the price point. 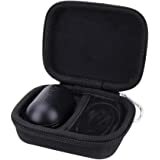 The case which stores the earbuds and also charges them has an excellent size and build quality. 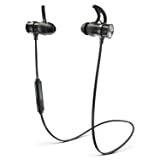 The earbuds itself feel durable and they seem to be well built. Sound Quality: out of the box the sound is really flat, luckily, you can modify it to your preferences which is really a plus. 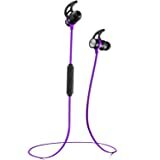 When working out I prefer bass heavier earbuds, this can be customized to a satisfactory level but don’t expect it to be a deep and rich heavy bass sound. Comfort: these earbuds are comfortable and even though I have a small ear canal, the earbuds come with multiple tips and I could find one that fit and it didn’t fall while running. However, if wearing them for prolonged you might experience some discomfort. Id say less than 2 hours of continuous use. Connectivity: the pairing process initially was easy but at times the Left earbud would fail to sync and I would have to turn off the Right earbud to pair the both of them again. I experienced a few drops while running mainly on the Left earbud but reconnection was automatic and somewhat quick. 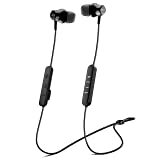 Range was decent but obviously lacking when compared to other inexpensive Bluetooth earbuds. The real deal breaker for me was the audio delay. 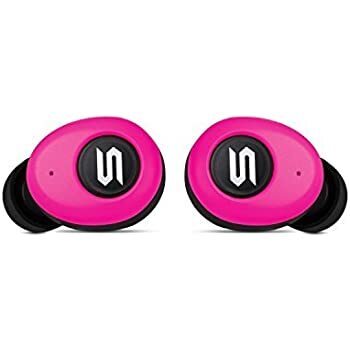 These earbuds are to be used almost exclusively for listening to music. When I tried to expand use of them by watching series/movies there was a significant audio delay that hinders the viewing experience. With earbuds this expensive (179.99 + tax) and only being able to use them for listening to music makes this purchase difficult to justify. 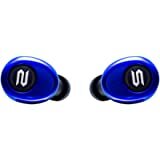 I could rationalize the purchase of these expensive earbuds if they delivered instant audio transmission. 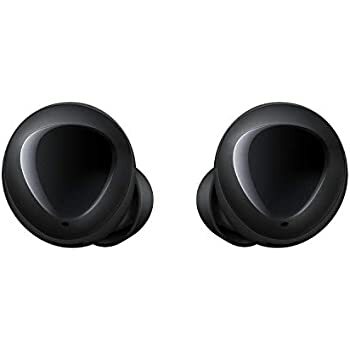 I can live with the less than perfect sound, the lesser range, the habitual disconnects BUT the audio delay is really something that limits the use of these earbuds. Conclusion: They are great for the sole purpose of listening to music. 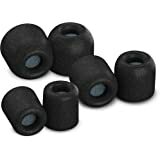 Expect a better than average audio quality. 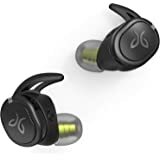 They are comfortable and I rarely experienced a wobbly feeling while running and I love that I don’t have a cable nagging on the back of my neck. Even the size is great because they are really inconspicuous. 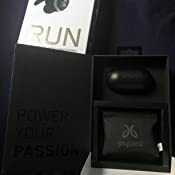 However, you will experience a few drops while running but the device reconnects after a few seconds. Audio transmission is inadequate to watch videos. I hope they can fix this. 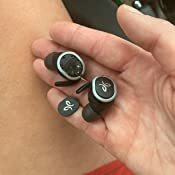 1.0 out of 5 starsAudio in the left ear continually drops and Jaybird has no answer for this problem. I just processed my return of these headphones. The audio in the left ear drops continually. On a 30 minute walk, I lost audio in the left ear more than 10 times. 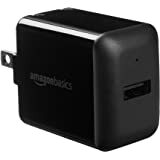 It was brief (2-5 seconds on average), but still enough to be completely distracting and certainly not what you'd expect from a product in this price range. 3) Make sure my phone is on the right side of my body - I tried the right pocket (front and back) and there was zero improvement. I tried running with the armband on my right arm. This did decrease the number of drops, but not completely. I previously wore my phone on my left arm but thought if it would help, I could adapt. It didn't solve the problem. I initially sent an email to the support team and got no response at all. None... So I Tweeted them and got a nice reply asking me to DM them and they'd help me. I was hopeful, but all they did was ask for my email address so their support could contact me (see attached image). 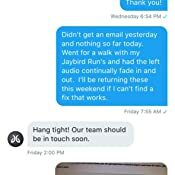 Almost a week later (and after another DM asking what's happening and being promised I'd hear from them soon) I finally gave up and let them know I was returning my Jaybird RUN's. This is a product that is clearly not ready for the market. 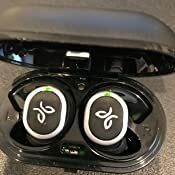 I realize there are a lot of high-end headphone companies coming out with the "truly wireless" models and Jaybird likely felt rushed to keep up with the market. It appears that rush to market has cost them a bit of their reputation. I'm going to give the Apple Airpods a try. I've heard the quality is fantastic, not heard of any complaints about dropped audio, and they will work seamlessly with my iPhone X. 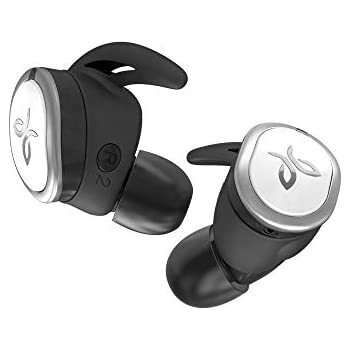 Sorry Jaybird, I know returns are expensive and I know a 1-Star rating has negative impact on sales, but I gave you ample opportunity to supply me and the myriad of users who also struggle with this problem, with a solution. If the time comes that you believe you have this problem 100% solved, I'd love to give it another try. 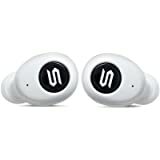 I researched these earbuds prior to purchase extensively and compared it with various companies. 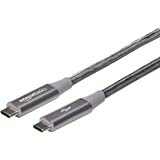 I went with these even knowing that multiple reviews had reported issues with connection and stuttering, etc. 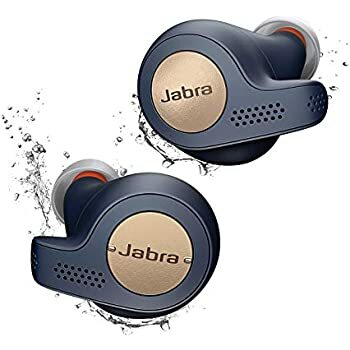 I ended up purchasing these due to satisfied usage with their previous earbuds and enjoyed the sound and fit, especially when running or shooting basketball, they stay very secure. The pair I received had multiple issues straight out of the box. 1. 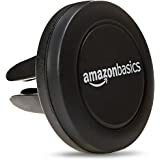 The right earbud button did not function so I was unable to perform any functions with it (play, pause, answer calls) but most importantly, I was not able to use it to shut off nor put it into factory reset mode. 2. 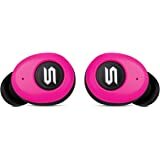 The connection between the earbud and sound when I had it in the house was decent with no issues. The moment I took it outside and had my phone in the armband (on the right arm as instructed), I started experiencing connection issues, stuttering, and lag pretty much immediately that I gave up and left them in the house. 3. 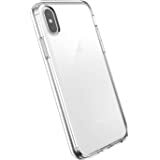 These issues continued despite ensuring the buds and case were fully charged, updated firmware, and repeated multiple times. 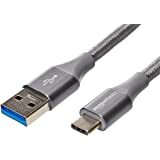 Given the fact that these issues came up immediately and I was unable to troubleshoot any issues myself, likely due to a hardware issue, I am returning these less than 24 hours after taking them out of the box. 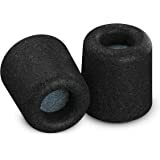 As other reviewers have noted, the left earbud will constantly cut in and out. I've reset them repaired them but the problem persists. 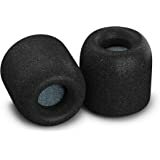 In addition, the ear tips have stretched out and now will come off easily, even to the point of staying in my ear after removing the earbud.